Objective: To identify the responsible allergens in patients with allergic rhinitis using skin prick test and further to help create the chart showing allergen distribution in Duzce region of Turkey. Methods: This retrospective case series included 192 patients diagnosed with allergic rhinitis between June 2014 and June 2016 in the private office of the author. The diagnosis of allergic rhinitis was based on patient history and physical examination findings. Allergopharma allergen extracts were used for skin prick testing. Twenty-eight allergens including histamine as the positive control, saline as the negative control and twenty-six allergens were drilled on the volar surface of the forearm. The results were evaluated after 15 minutes. The negative (-), positive (+), (+++) and (++++) results were assessed and analyzed. Result: Seventy-five percent of the patients (n=144) were male. Mean age of the patient population was 30.8 ± 7.3 years. The ratio of patients responding to at least one allergen was 83.3% (n=160). 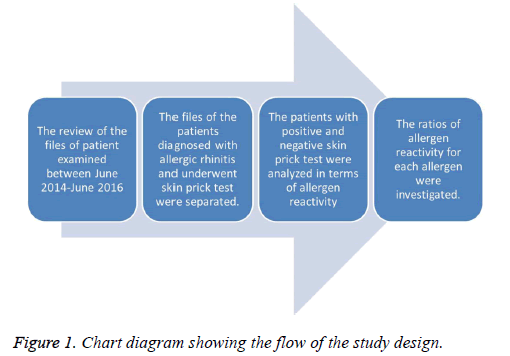 In 160 patients with positive response to the skin prick test, the minimum and a maximum number of allergens to which a positive skin prick test was obtained were 1 and 21 respectively. The most common allergens responsible for the positive response to the skin prick test were mites in 124 patients (77.5%), tree pollens in 118 patients (73.8%), grass pollens in 118 patients (73.8%), and fungi in 114 patients (71.3%). Conclusions: The most common allergens in patients with allergic rhinitis in Duzce region were mites, trees pollens, and grass pollens. Allergic rhinitis, Allergen, Prick test. Allergic rhinitis is an inflammatory nasal mucosal disease characterized by attacks of sneezing, profuse watery nasal flow, nasal congestion, and itching. This reaction is caused by IgE-mediated Type 1 hypersensitivity reaction and is secondary to allergic contact of the nasal mucosa. Physical examination typically reveals conchal hypertrophy, pale color of the concha mucosa and excessive serous secretion. Allergic rhinitis has been classified as seasonal, perennial and occupational allergic rhinitis based on the period of exposure to the allergen. Perennial allergic rhinitis is usually caused by house dust mites, fungi, insects (cockroaches) and animal feathers. Seasonal allergic rhinitis is caused by various extraneous allergens such as pollen and fungi. Distinguishing these two types may not always be straightforward. For example, a patient with seasonal allergic rhinitis may have allergies to a variety of pollens that develop at different times of the year, and their symptoms may suggest perennial rhinitis. Also, in some regions, pollens and fungi may be present around throughout the year. On the other hand, symptoms of perennial allergy may not persist throughout the year . Allergic rhinitis is a disorder most commonly seen among patients with immunologic and chronic diseases with a growing incidence, affecting 10-30% of the population,particularly in developed societies. While allergic rhinitis has a prevalence of 7% in northern European countries, it is ranked sixth among chronic diseases in the US [2,3]. Studies in Turkey on rhinitis reveal a prevalence ranging between 9% and 20% [2,4,5]. While allergy is pre-diagnosed through patients history and examination, in vivo skin tests or in vitro serological tests are used in definitive diagnosis. Among epicutaneous allergy tests, skin prick test (SPT) is the one that is most commonly used. In the SPT, the response of the skin to the IgE-associated allergen is assessed. In vivo tests are more reactive and less expensive compared to in vitro tests. Therefore, SPT is the most preferred one to identify the allergen . In patients with allergic rhinitis, identifying the allergens that cause the symptoms as well as the environmental distribution of allergens constitute the most important step in the treatment of the disease. Also, identification of allergens is essential for prevention and immunotherapy treatment approaches. The purpose of this study was to identify the allergens responsible for allergic rhinitis in Duzce Province of Turkey and to help create the chart showing allergen distribution for this region. This retrospective case series included the patients diagnosed with allergic rhinitis in a private office in Duzce Province of Turkey between June 2014 and June 2016. The pre-diagnosis of allergic rhinitis was based on patient history and physical examination findings. Patients were clinically diagnosed with allergic rhinitis based on continuous sneezing attacks, frequent and watery nasal flow, nasal obstruction, itching eyes and nose, allergic conjunctivitis, atopic features, pale and hypertrophic concha, pale nasal cavity mucosa and ominous secretion. The patients were scheduled for an SPT examination after a drugfree period of at least 14 days including topical and systemic corticosteroids, antihistaminic and immunosuppressive drugs. Allergopharma allergen extracts were employed for SPTs. The volar aspect of the forearm was wiped with alcohol. Twentyeight points each spaced 3 cm apart and at least 2-3 cm from the wrist and the antecubital fossae were marked with a pen. Histamine as the positive control and saline as the negative control was dropped on the first and second mark, respectively. Other allergens were dropped successively in a total of 26 drops as classified in 8 groups. The twenty-six allergen extracts were as follows; mite (Dermatophagoides pteronyssinus), corn flour, wheat flour, rice flour, grass, meadow grass, wheat, oat and tree pollens, olive, oak, pine, poplar, fungi for hazelnut, Aspergillus fumigatus, dog hair, fowl feather, cat hair, Budgerigar feather, egg white, egg yolk, chicken, cow milk, cacao, walnut, strawberries and insects, cockroach. The allergens were drilled by a disposable plastic lancet at an equal length. The results were evaluated after 15 minutes. The presence and diameter of endurance were assessed. As part of the assessment, a negative (-) was assigned to no endurance or endurance close to negative control. A positive (+) was assigned if endurance diameter was less than the half of the endurance diameter of the positive control. A (+++) result was assigned if the sizes for both allergen and positive control were the same. A (++++) result was assigned if the endurance for the allergen was twice or bigger than the endurance diameter of the positive control [4,7]. A diagram showing the flow of the study is presented in Figure 1. The test result of each patient was recorded as a separate data file and entered into the SPSS statistical database. Descriptive statistics were calculated in the analyses. The incidence of allergens was assessed. Figure 1: Chart diagram showing the flow of the study design. A total of 192 patients were enrolled in the study. Of those, 75.0% (n=144) were female, and 25.0% (n=48) were male. The age of the patients varied between 18-65 y. Mean age was 30.8 ± 7.3 y. The ratio of patients responding to at least one allergen was 83.3% (n=160). Despite clinical allergic rhinitis symptoms, no response to allergens was obtained in 32 patients (16.7%). In 160 patients with positive response to the SPT, the minimum and a maximum number of allergens responded to was 1 and 21 respectively. Out of the cases with a positive response to the SPT, 124 (77.5%) showed seasonal allergic rhinitis, and 36 (22.5%) showed perennial allergic rhinitis. It was found that complaints suffered by patients with seasonal allergic rhinitis mostly occurred during the months April-May. Allergens responsible for the positive response to the SPT are, in descending order, mites in 124 patients (77.5%), tree pollens in 118 patients (73.8%), grass pollens in 118 patients (73.8%), and fungi in 114 patients (71.3%), followed by foodstuffs in 68 patients (42.5%), flours in 52 patients (32.5%), epithelium in 46 patients (28.8%) and most frequently insects in 34 patients (21.3%) (Table 1). Most common symptoms in cases of seasonal allergic rhinitis were found to be sneezing, nasal obstruction, nasal flow, and nasal itching in descending order. The symptoms were in the order of nasal obstruction, nasal discharge and sneezing in cases with perennial allergic rhinitis cases. Most common grass pollen allergens were corn, grass, wheat and meadow grass. These pollens are followed by pine, hazelnut, poplar, olive and oak pollens. Positive skin prick response was most common in rice flour among flours, dog hairs among epithelium, and egg white among foodstuffs. Table 1. Distribution of allergens found to be positive to the skin prick test. Allergic rhinitis is not considered a serious problem as it is not a life-threatening illness. Recommended drugs yield temporary benefits without referring to medical help. Nonetheless, allergic rhinitis significantly poses social, clinical and economic harms. Most of the patients exhibit allergic rhinitis symptoms for more than three months per year, which impairs the quality of life. Rhinitis leads to economic issues due to its effects of work absenteeism in adults and school absenteeism in children. Therefore, diagnosis and treatment approach in allergic rhinitis is significant. Effective treatment will also help to treat other coexisting diseases such as asthma, sleep disorders, otitis media . The diagnosis of allergic rhinitis is based on medical history, symptoms, physical examination and laboratory tests. Examination findings are often not specific. Findings found in nasal examination are mostly similar to those seen in other rhinitis types. The reliability of skin tests in the diagnosis of allergic rhinitis is controversial . Negative result of the skin test does not discard the allergic rhinitis diagnosis. However, a skin test with a positive response to any allergen is crucial in formulating the diagnosis and treatment scheme. If skin testing is conducted correctly, it is useful to confirm the diagnosis of specific allergy. It was reported that SPT with a positive response in allergic rhinitis cases was in the range of 56.7-85.5% [4,8-11]. In our study, we found a positive response to any allergen in 83.3% of the patients. Rasool et al. reported that SPT was positive in 86.4% of patients with allergic asthma, 68.5% of patients with allergic rhinitis and 1.6% of patient with urticaria, respectively . The authors also declared that allergen immunotherapy was effective in 58% patients with allergic rhinitis and 42% allergic asthma. Allergic rhinitis is most prevalent in school-age children and young adults. The reactivity to the SPT tends to decline in older ages . In our study, mean age was found to be 30.8 ± 7.3. Mean age was found to be 30.2 ± 13.1 by Keleş et al. , 30.4 ± 5.8 by Ceylan et al. , and 28.1 ± 11.8 by Sahin . Our study was found to be consistent with the literature data regarding mean age. Allergens can be divided into two types, namely indoor and outdoor allergens. While house dust mites, domestic hairy animals, cockroaches and fungus spores are considered to be indoor allergens; tree, meadow, cereal pollens and fungus spores are regarded as outdoor allergens . In our study, allergens with most common positive responses to SPTs were found to be mites (77.5%), tree pollens (71.3%), grass pollens (70.1%) and fungi (71.3%). In Balıkesir region of Turkey, Şahin  found that tree pollens (79.7%) were the most frequent allergen followed by weeds (69.9%) and mites (56.5%). Ceylan has found that grass pollens (66.7%), cereal pollens (31.1%) and cockroaches (22.2%) were the most prevalent allergens in Sanlıurfa . Keles et al. reported that herbs-cereals (60.5%), Mediterranean herbs (43.0%) and mites-1 (31.5%) were the most frequent in Elazig region . Grass blend (70.5%), tree pollens and mites (72.5%) were reported to be common allergens in Isparta,  Ankara  and Duzce,  respectively. House mites were found to me predominant allergen in low-lying regions including Edirne and Antalya . In India, in patients of nasobronchial allergy, most common offending allergens were insects (21.2%), followed by dust (12.0%), pollens (7.8%), animal dander (3.1%), and fungi (1.3%) . In China, a study investigating the allergen profile in 350 patients with allergic rhinitis found that the total positive rate of inhaled allergens as 78.86% . In that study, the most frequent of allergen was chenopodium (78.86%), ragweed (36.86%), artemisir (28%), timothy (27.14%), elm (5.71%), willow (25.14%), poplar (18.86%), cockroach (18.86%), dust-mite (14.86%), flour mite (14.86%) and Alternaria spp (2.86%). In a similar study from China investigating the allergen profile in 1,979 patients with allergic rhinitis found that 78.1% of patients had positive SPT results. The most common allergen was flour mite (80.4%), followed by house dust mite (64.9%), cockroach (13.3%) and artemisia pollen (8.2%) . Allergic rhinitis symptoms are spontaneous or remedial symptoms such as nasal itching, sneezing, watery nasal flow and nasal obstruction. These may also be accompanied by a headache, impaired smell, and other coexisting disorders. In our study, most common symptoms in cases of seasonal allergic rhinitis were found to be, in descending order, sneezing, nasal obstruction, nasal flow, and nasal itching. On the other hand, such symptoms were in the form of nasal obstruction, nasal discharge and sneezing in cases with perennial allergic rhinitis. According to Keleş et al. the most common symptoms of seasonal and perennial allergic rhinitis were sneezing and nasal obstruction, respectively. Ornek et al. reported the 'Sneezing' as the most common symptom. (82%) Tatar et al. investigated the correlations between the severity of symptoms in allergic rhinitis and the results of SPT . The authors found no significants correlations between the size of the wheal and symptoms score (0 for no symptoms, 1 for mild, 2 for moderate, and 3 for severe), quality of life questionnaire, and visual analog scale scores. No clinical finding occurs at the first encounter with an allergen because no specific IgE has been produced yet and substance has not been identified as an allergen. When an allergen encounters the immune system, immune cells produce IgE. IgE is specific to a particular antigen and react only upon encountering with that allergen. For this reason, they are called “specific IgE.” IgE is deposited on mast cells. Since specific IgE is produced after the first contact, an allergic reaction occurs only on the second contact . Jiang et al. investigated the correlations between two methods of measuring serum IgE and SPT which was used as a reference standard found that IgE measuring systems can identify potentially significant allergens in the diagnosis of allergic rhinitis . Also, using the cockroach, housefly and mosquito aeroallergens, Kumar et al. found a significant correlation between the grades of SPT reactions and serum specific IgE levels against cockroach, housefly and mosquito aeroallergens . However, Mehl et al. found low concordance between SPT and serum IgE for cow’s milk and hen’s egg and suggested that the tests should not be used interchangeably . In one study, the diagnostic power of the SPT for egg white was determined to be significantly higher compared to the diagnostic power of the serum IgE . In conclusion, our results that explore the allergen profile in Duzce Province are consistent with other studies reported from especially West part of Turkey. Alerjikrinit KN. Kulak Burun Bogaz Hastaliklari ve Bas Boyun Cerrahisi. Günes Kitapevi 2004. Rinit UH. Kulak Burun Bogaz Hastaliklari ve Bas Boyun Cerrahisi. Turgut Yayincilik; 2002. Bayram A, Oymak S, Gülmez Ö, Demir R, Büyükoglan H. Astimda atopi ve alerjik rinit sikligi. Erciyes Tip Dergisi 2010; 32: 27-34. Keles E, Karlidag T, Alpay HC, Akyigit A, Kaygusuz I, Yalçin S. Alerjik Rinitli Olgularimizda Semptomlar ve Cilt Testi Ile Saptanan Alerjenlerin Dagilimi. KBB-Forum Dergisi 2010; 9: 20-24. Cingi C, Topuz B, Songu M, Kara CO, Ural A, Yaz A, Yildirim M, Miman MC, Bal C. Prevalence of allergic rhinitis among the adult population in Turkey. Acta Otolaryngol 2010; 130: 600-606. Jinshu Yin, Xiaorong Li, Xueyan Wang. Persistent fever caused by allergic reaction? Biomed Res India 2017; 28: 3487-3489. Sahin F. Balikesir'de alerjik rinitli hastala rda prick testi sonuçlari. Türk Otolarengoloji Arsivi 2009; 47: 169-173. Ceylan E, Gencer M, San I, Iyinen I. Alerjik rinitli olgularimizda prick testlerde saptanan aeroallerjen dagilimi. Türkiye Klinikleri J Med Sci 2006; 26: 370-374. Örnek T, Yalçin Demirtas F, Sagit M, Gölcük A, Ekin S. Atopik semptomlu hastalarda deri prick testi sonuçlari ve total lgE düzeyi ile iliskisi. Harran Üniversitesi Tip Fakültesi Dergisi 2010; 7: 8-11. Öztürk Ö, Tokmak A, Güçlü E, Yildizbas S, Gültekin E. Düzce’de alerjik rinitli hastalarda prick testi sonuçlari. Düzce Tip Fakültesi Dergisi 2005; 1: 11-14. Uslu C. Erzurum'da alerjik rinitli hastalarda prik testi sonuçlari. KBB Klinikleri 2003; 5: 22-25. Rasool R, Shera IA, Nissar S, Shah ZA, Nayak N, Siddiqi MA, Sameer AS. Role of skin prick test in allergic disorders: a prospective study in kashmiri population in light of review. Indian J Dermatol 2013; 58: 12-17. Heinzerling L, Mari A, Bergmann KC, Bresciani M, Burbach G, Darsow U, Durham S, Fokkens W, Gjomarkaj M, Haahtela T, Bom AT, Wöhrl S, Maibach H, Lockey R. The skin prick test - European standards. Clin Transl Allergy 2013; 3: 3. Karabulut H, Karadag AS, Acar B, Demir M, Babademez MA, Karasen RM. Ankara Keçiören bölgesinde deri prik testi sonuçlarinin meteorolojik ve demograf ik özelliklere göre degerlendirilmesi. KBB-Forum Dergisi 2009; 8: 46-54. Yasan H, Aynali G, Akkus Ö, Dogru H, Özkan M, Sahin M. Alerjik rinitt en sorumlu alerjen profilinin degisimi ve semptomlarla korelasyonu. KBB-Forum Dergisi 2006; 54: 158-160. Çakir Edis E, Tabakoglu E, Çaglar T, Hatipoglu ON, Altiay G. Skin prick test results in patients from thrace region presenting with pulmonary symptoms. Balkan Med J 2007; 24: 6-12. Prasad R, Verma SK, Dua R, Kant S, Kushwaha RA, Agarwal SP. A study of skin sensitivity to various allergens by skin prick test in patients of nasobronchial allergy. Lung India 2009; 26: 70-73. Wang C, Zhang H, Chen X, Zheng Y. Investigation of skin prick test on patients with allergic rhinitis in Urumqi area. Lin Chung Er Bi Yan Hou Tou Jing Wai Ke Za Zhi 2014; 28: 718-720. Zhang L, Han B, Zhang Z, Liu A, Liu G, Du Z, Yao Y, Qi Q. Skin prick test of inhalative allergens for patients with allergic rhinitis in Yichang. Lin Chung Er Bi Yan Hou Tou Jing Wai Ke Za Zhi 2014; 28: 98-101. Tatar EC, Sürenoglu UA, Saylam G, Isik E, Ozdek A, Korkmaz H. Is there any correlation between the results of skin-prick test and the severity of symptoms in allergic rhinitis? Am J Rhinol Allergy 2012; 26: e37-39. Jiang XD, Li GY, Sha JC, Zhu XW, Meng CD, Dong Z, Zhu DD. Correlation analysis of two serum specific IgE test systems and skin prick test in allergic rhinitis patients. Zhonghua er bi yan hou tou jing wai ke za zhi 2010; 45: 652-655. Kumar R, Gupta N, Kanuga J, Kanuga M. A Comparative Study of Skin Prick Test versus Serum-Specific IgE Measurement in Indian Patients with Bronchial Asthma and Allergic Rhinitis. Indian J Chest Dis Allied Sci 2015; 57: 81-85. Mehl A, Niggemann B, Keil T, Wahn U, Beyer K. Skin prick test and specific serum IgE in the diagnostic evaluation of suspected cow's milk and hen's egg allergy in children: does one replace the other? Clin Exp Allergy 2012; 42: 1266-1272. Nacaroglu HT, Erdem SB, Karaman S, Dogan D, CS UK, E TK, Can D. Diagnostic values for egg white specific IgE levels with the skin prick test in Turkish children with egg white allergy. Allergologia Et Immunopathologia 2017.